Another great Tuesday! 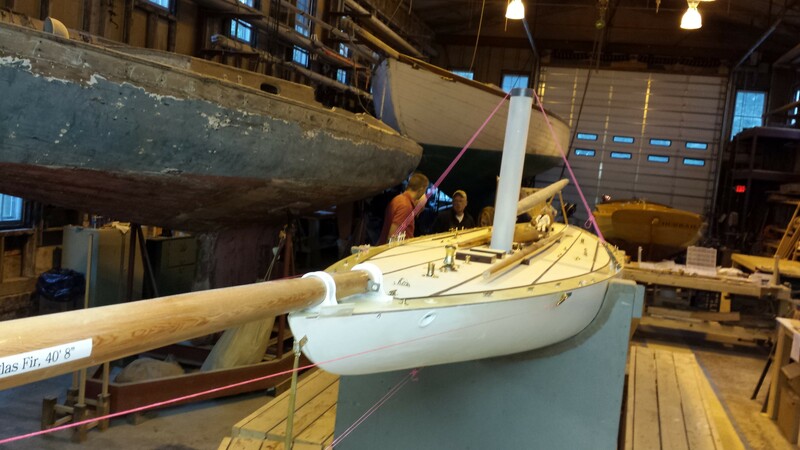 Sometimes, we just have to step back from our scale model and remember how huge the real RELIANCE was. 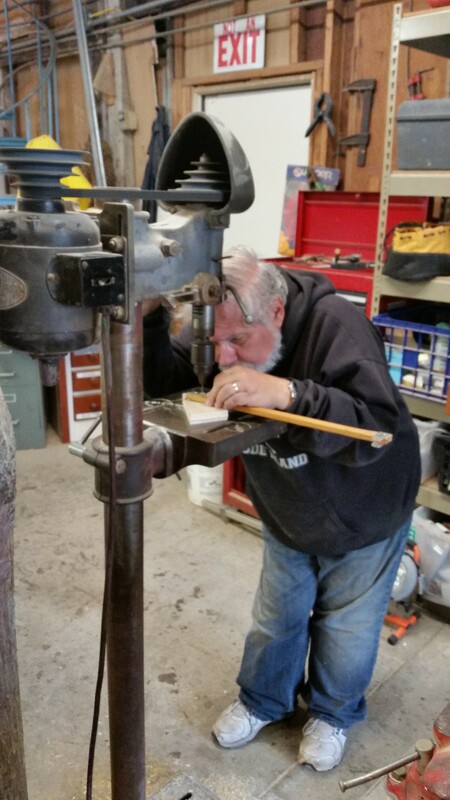 Case in point: Bill was working on our spreader when I took this picture. 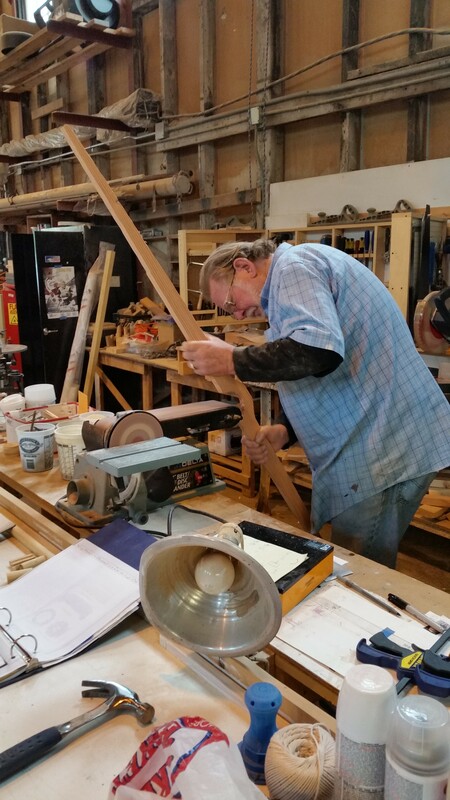 Bill is well over six feet tall. Then it hits you. How long was the real spreader? Answer, 34 feet! (I had to check our plans to make sure we hadn’t goofed. It didn’t seem real.) Wider than the beam of RELIANCE as shown in the photos. 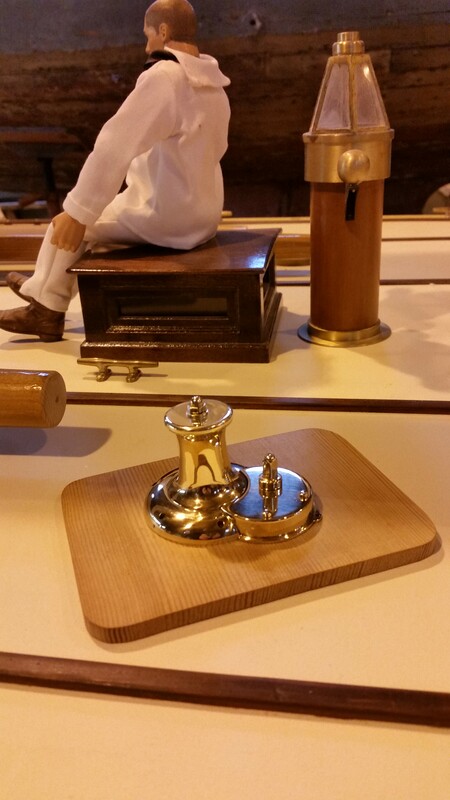 And then Burr delivered the final version of our anchor windlass. Another piece of high fashion jewelry for RELIANCE. More bling! 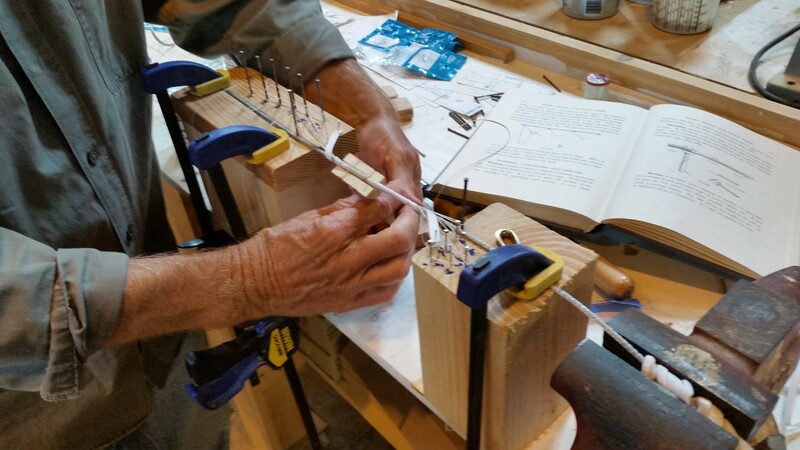 Meanwhile, Herb made another scale serving mallet and is practicing worming, parcelling and serving (worm and parcel with the lay, serve the other way) and wire splicing. 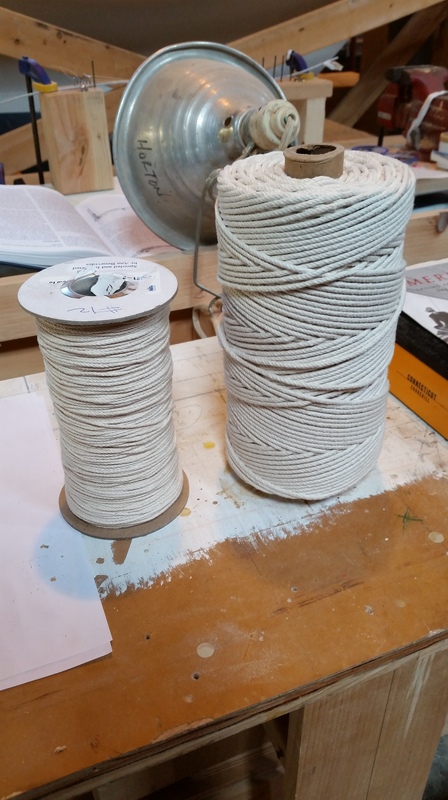 Next step to practice worming and serving with wire. 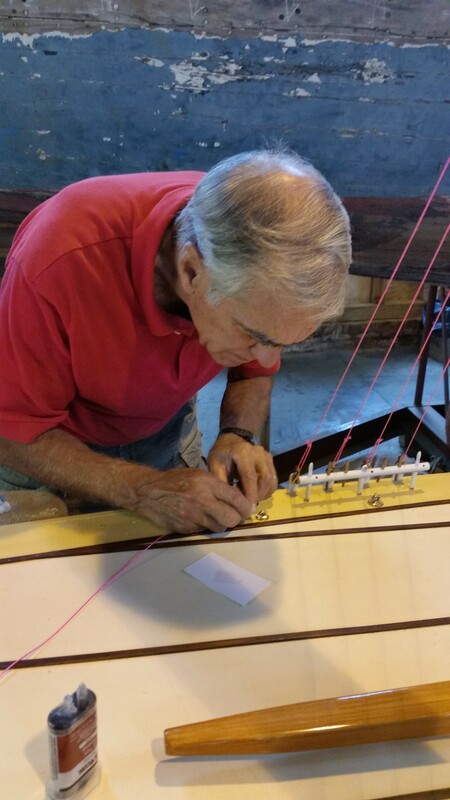 Keith continues to fashion our rudder – equally as monstrous as the spreader. 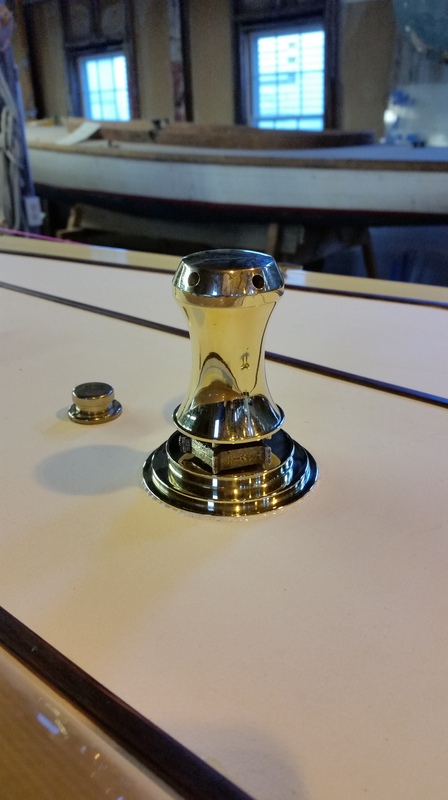 This entry was posted in Builder's Notes & Pictures and tagged America's Cup, anchor windlass, Herreshoff, Herreshoff Marine Museum, HMCo, R&W Rope, RELIANCE, RELIANCE Project, small scale on October 22, 2014 by Herreshoff Marine Museum/America's Cup Hall of Fame. Sometimes when you think progress is slow, all it takes is to look back one year. 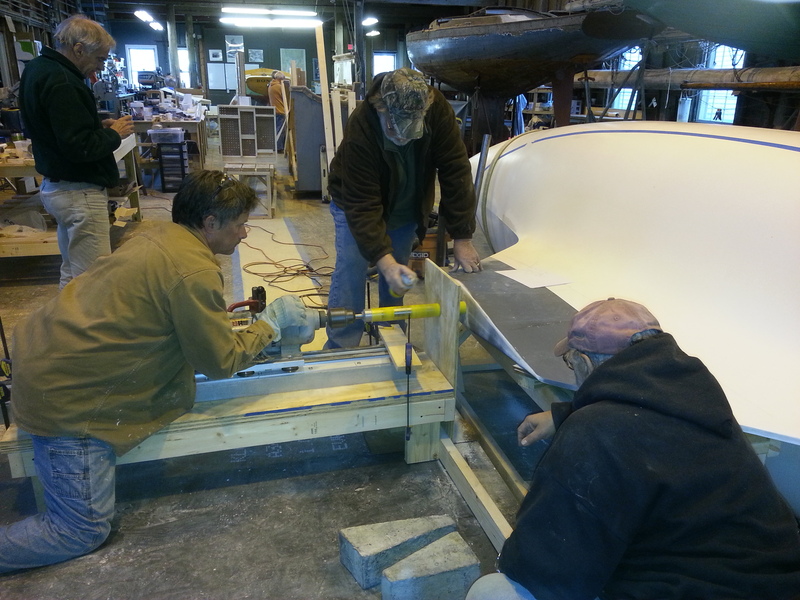 These pictures taken in Oct. 2013 show the hull on her side so we could drill rods through the keel for a display cradle. Nothing yet on deck. In fact we still had to open up her top to insert innards. Wow! We have done a lot in the past year. 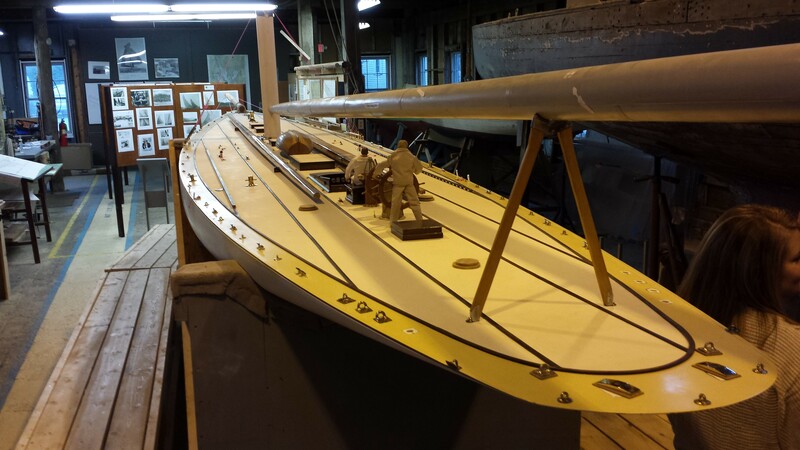 This entry was posted in Builder's Notes & Pictures and tagged America's Cup, Herreshoff, Herreshoff Marine Museum, Look Back, One Year Ago, RELIANCE, RELIANCE Project on October 16, 2014 by Herreshoff Marine Museum/America's Cup Hall of Fame. Just returned from ten day trip to Santa Fe, Taos and the Canyons of NM, AZ, and UT. Must say that our RELIANCE is certainly the equal of the great art of Santa Fe and Taos (no bias all all!) but it is very hard to compete with the grandeur, scale, and beauty of nature. No contest, it is nature every time…. We flew home from Las Vegas: I am still struggling to wrap my head around the mirage of Las Vegas appearing out of the desert after visiting Grand, Glen, Bryce and Zion Canyons and Monument Valley….. In my absence, work continued on RELIANCE with multiple efforts underway. 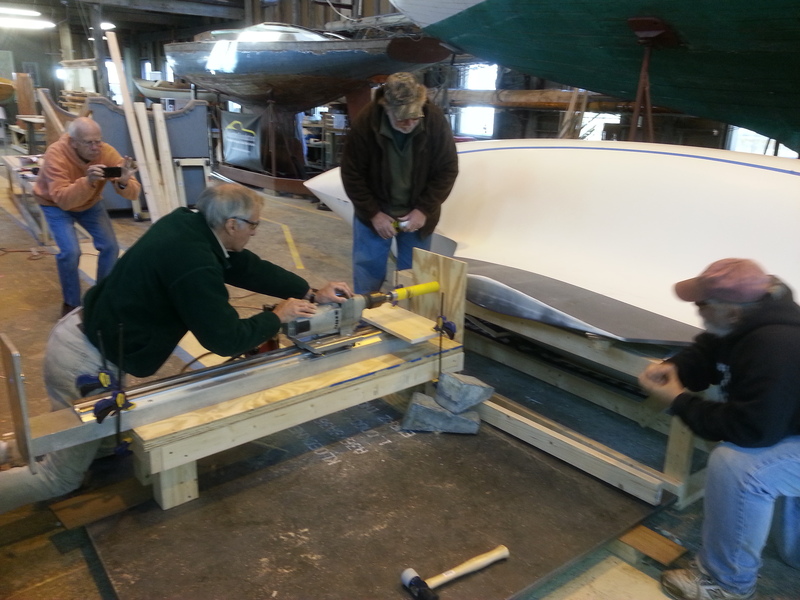 Bill is also working on the spreaders (photo 3). Keith is placing miniature rivets in pad eyes (photo 4). 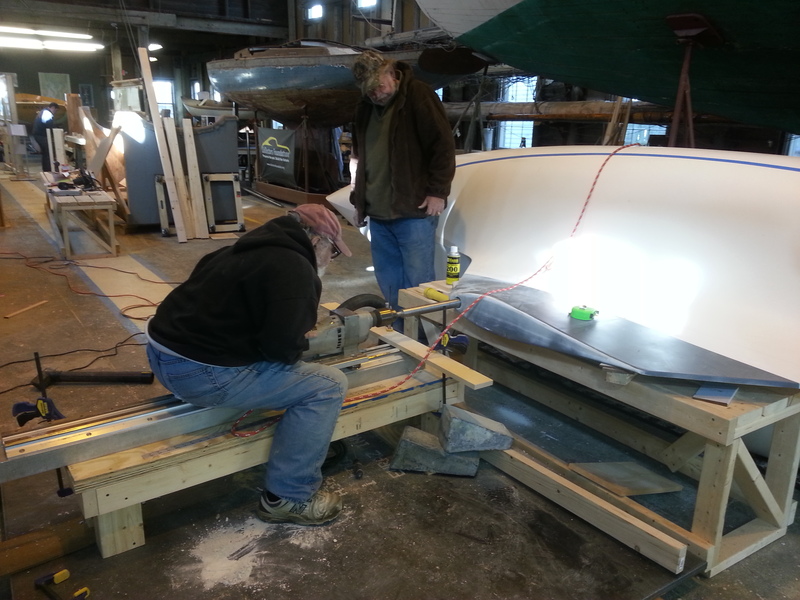 (These latest fittings bring RELIANCE into conformity with our “Configuration Date” (First AC race). 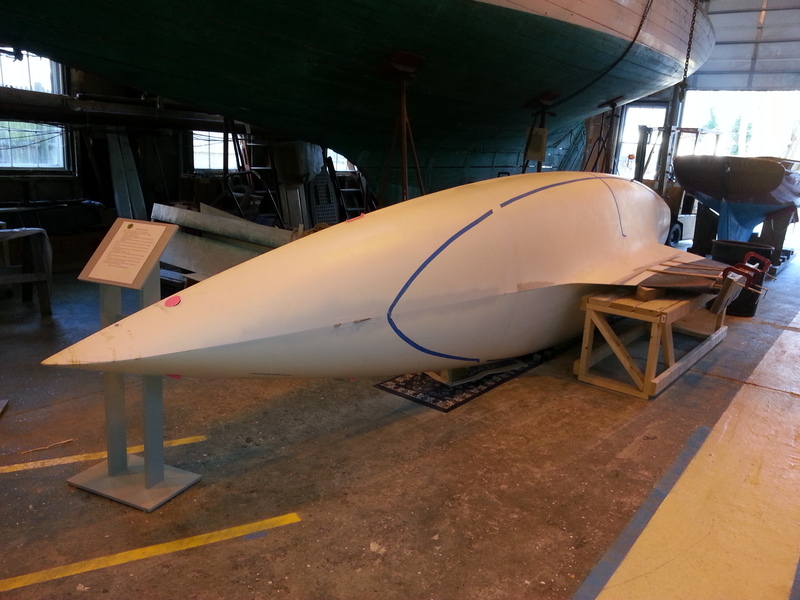 From pictures we can see that fittings and components were added, moved and changed during the racing campaign. 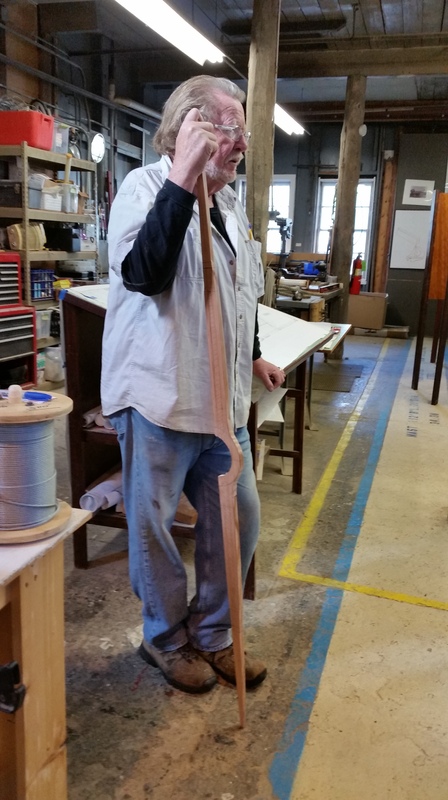 Steve is working on the boom crotch (photo 5). 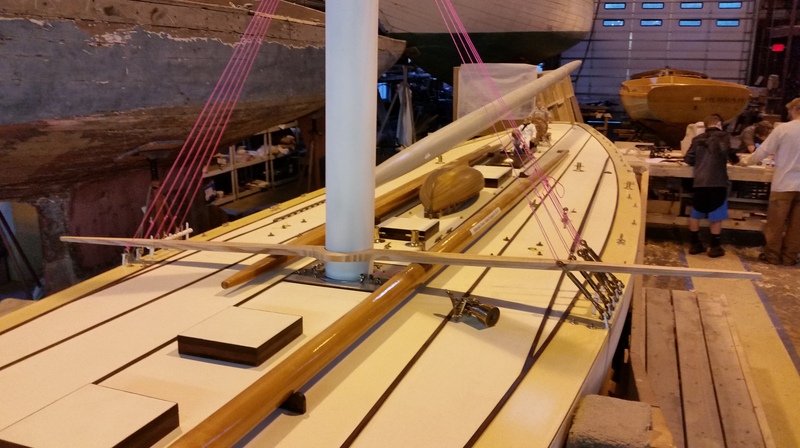 Although our RELIANCE will ultimately be posed underway with sails, we anticipate that for a short interim period until the atrium is built, she’ll be displayed at a mooring with topmast housed, and gaff, boom and mainsail resting on the boom crotch. 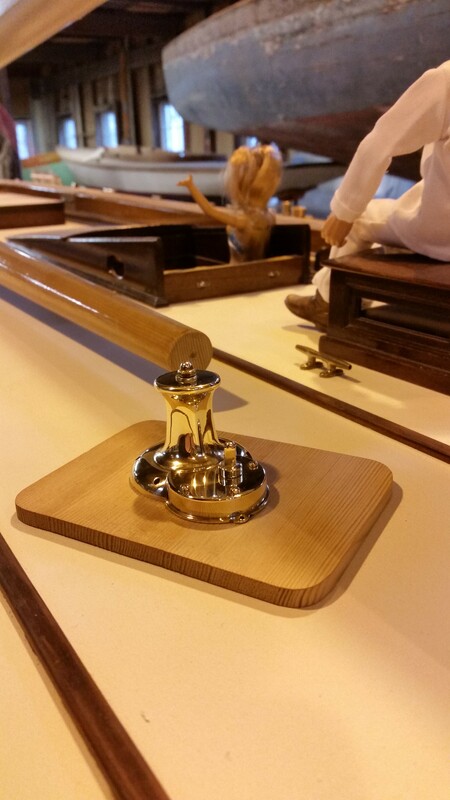 Meanwhile Mike and Harrison Casting Co are making our gooseneck assembly, and Burr is completing the capstan assemblies. 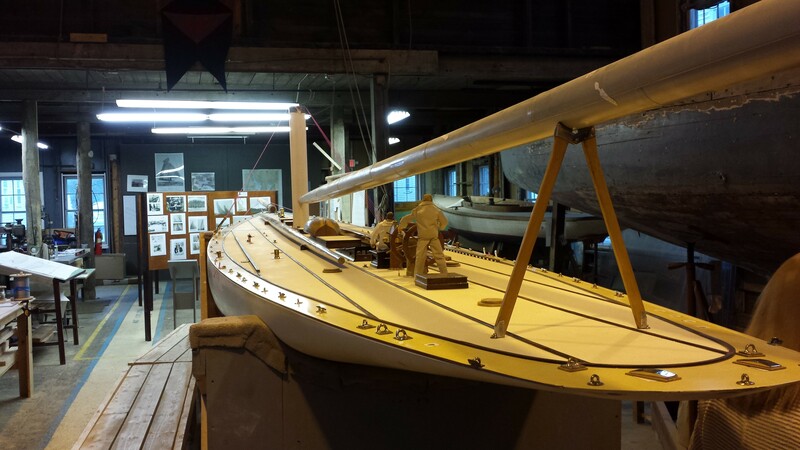 This entry was posted in Builder's Notes & Pictures and tagged America's Cup, boom, Bristol, building 28, Capt. 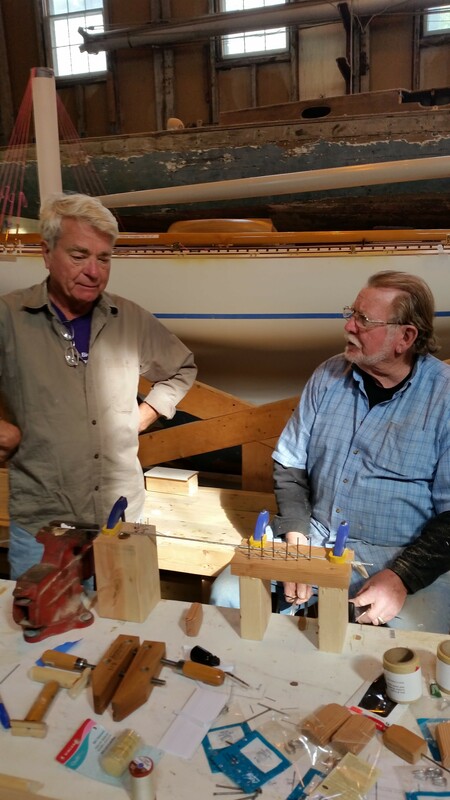 Barr, casting, gaff, harrison casting co, Herreshoff, Herreshoff Marine Museum, HMCo, jigs, las vagas, mainsail, model, model making, RELIANCE, RELIANCE Project, Wooden Boat on October 9, 2014 by Herreshoff Marine Museum/America's Cup Hall of Fame.